With thanks to Will, a lovely park ranger who answered my questions, gave me a fabulous book on Vicksburg’s monuments, and tipped me off to the gastronomic delight that is Mother’s Restaurant in New Orleans. Having lived in the mid-Atlantic region for many years, I have already been to the majority of the Civil War battlefields in Maryland and Virginia, and of course, to Gettysburg. They are all well presented, heartbreaking, and monumental each in their own way. Yet I was wholly unprepared for the sheer beauty of Vicksburg, the manner in which the tragic efforts of approximately 100,000 men have been commemorated, and most surprisingly to me, the fact that so many of the monuments are Classical in style. Indeed, there are so many references to and copies of Classical art and architecture that I could probably write twenty blog posts (don’t worry, I won’t). The Vicksburg Memorial Arch at the entrance to the park resembles a Roman triumphal arch, numerous state monuments are composed of obelisks (New York, Navy Memorial), columns (Louisiana, Wisconsin) or some combination of these devices (North Carolina, Texas, Iowa). A number of states combine the obelisk or column with a bronze sculpture based on a Greek or Roman deity. 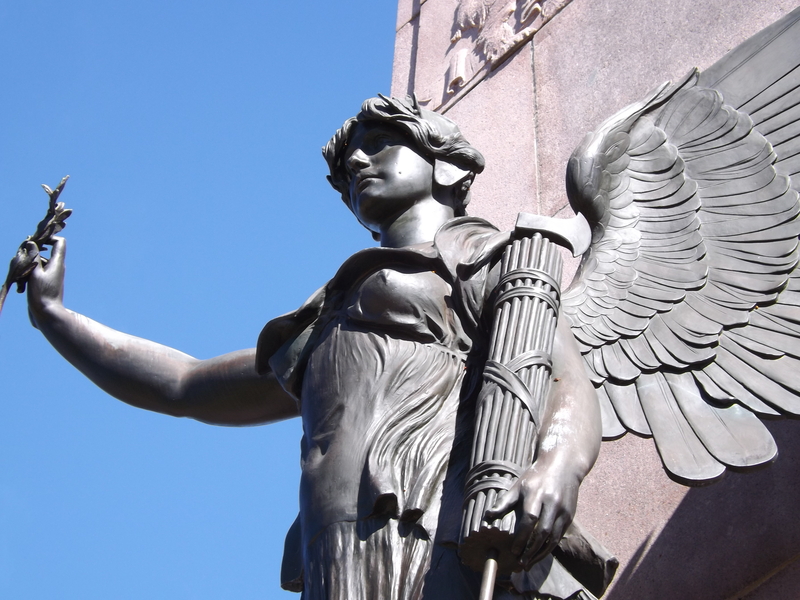 Michigan‘s statue of the ‘Spirit of Michigan’ is based on Athena Promachos as sculpted in the fifth century BC by Phidias. 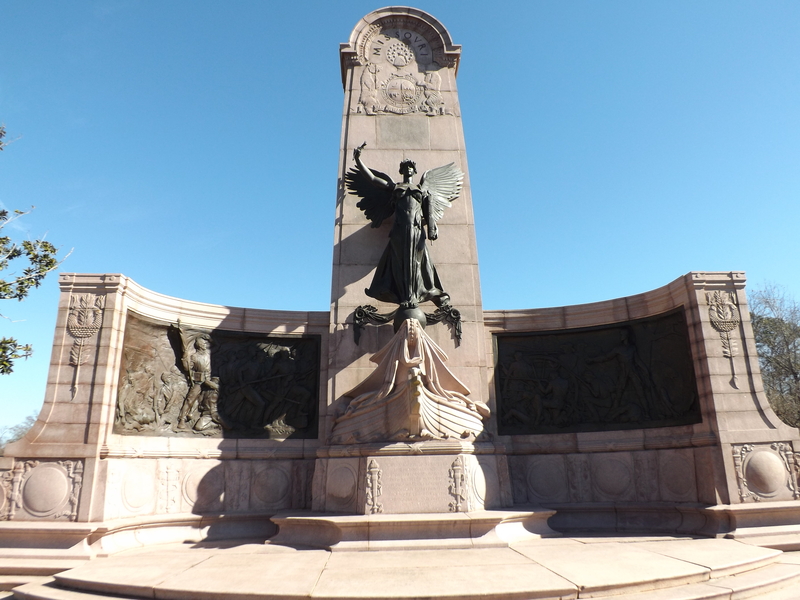 The ‘Statue of Peace’ at the base of the Minnesota memorial copies the iconography of the Roman goddess Pax. 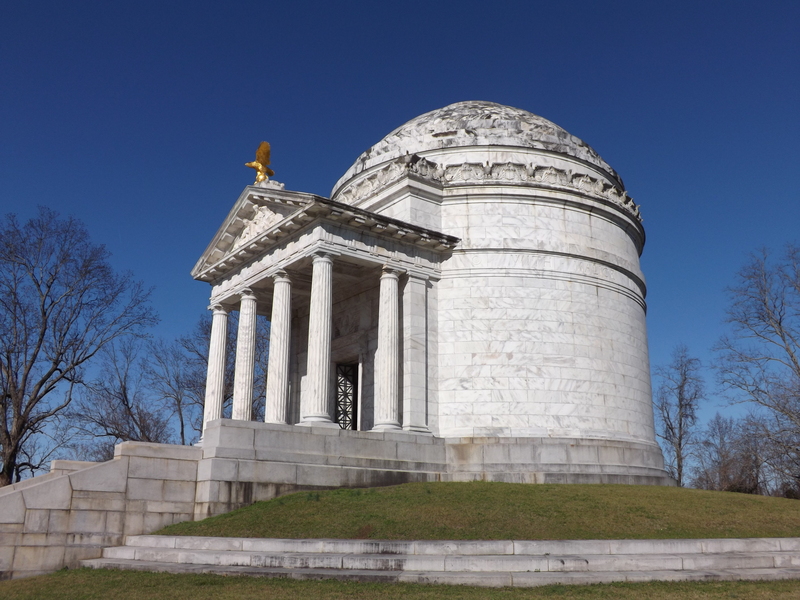 Ohio, the only state that didn’t erect a single monument but a series of them around the park, built a number of small memorials that resemble a temple façade, similar to the aedicula style tomb popular in Roman cities in the first centuries BC and AD. Pennsylvania also built a monument resembling an ancient tomb, choosing a large exedra with a central pillar, with an inscription carved into the rear of the bench that closely resembles the bench tombs, or scholae, that appear in the necropoleis of ancient Pompeii. Clio, the Greek muse of history, is also a popular feature, appearing in conjunction with an obelisk on the Mississippi monument, as well as in the tympanum of the Illinois memorial. There are two state memorials in particular, however, which were outstanding for their replication of ancient styles. The first, and perhaps most surprising, is the monument constructed by the state of Illinois. As this state contributed the largest number of men to the Vicksburg campaign, more than 36,000, it is not surprising that they also have the largest memorial. What may be more unexpected however, is that the designers of this structure chose to replicate the Pantheon in Rome. The Pantheon, built in the early second century AD under Hadrian, was intended to honour the gods of Rome. But by the late eighteenth century, pantheon had become a term used to describe a monument to the dead, and thus was viewed as a fitting model by the architect of the memorial, Major William Le Baron Jenney, who stated that he wanted to design ‘not only a grand and imposing commemorative structure worthy of the State of Illinois, but a temple of fame as well, within the walls of which will be preserved in enduring bronze and stone the name of every soldier from Illinois who participated in that memorable and decisive campaign and siege.’ Although a scaled down version of the original Roman temple, this pantheon is similar in proportions, following the alignment and ratio of dimensions as directed in the first century BC books of the architect Vitruvius. Like its model, the roof has an oculus, a coloured marble floor, and a sculptural group in the tympanum. 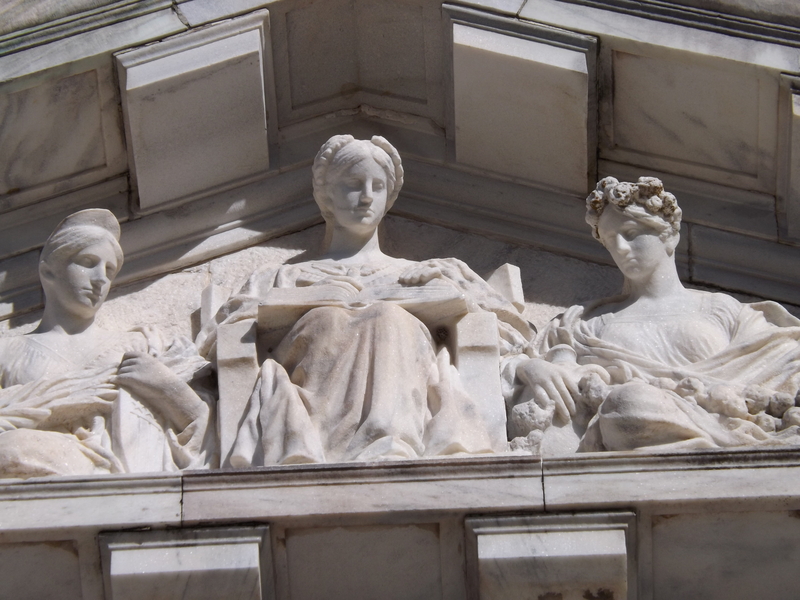 The three marble figures depict Clio, the muse of history, seated between personifications of North and South, recording the names of the dead in a ledger. Rather than sculptures of gods placed around the interior of the round chamber, there are sixty bronze plaques affixed to the walls inscribed with the names of the Illinois corps. There are, of course, other elements of decoration that are clearly American in design, such as the large gilded eagle, various symbols of the Republic in the exterior moulding, and an inscription of a quote from Abraham Lincoln’s second inaugural address. However, there is a significant difference in design apart from size, which I find rather interesting: this memorial uses the Doric order in combination with an egg and dart design more commonly found in conjunction with the Ionic order, whereas the capitals of the original Pantheon are Corinthian. This may seem a trifling feature of the design to be concerned with, but it speaks to an overall amalgamation of styles that is typical of the Classically themed structures found in the park. Until 2001, this was the only monument that honoured the fighting men of both the Union and Confederate armies, as Missouri was a border state that was divided in its loyalties. It consists of a large stele, fronted by a bronze female figure standing on the prow of a boat, framed by an exedra with bronze reliefs depicting both Union (left) and Confederate (right) soldiers in action. The style is described as Roman composite, but this is not the traditional composite order which combined elements of Ionic and Corinthian style. Instead, it seems to be something of a slightly (at least to the view of a Classicist) muddled combination of elements of both Greek and Roman influence. The stele itself is common enough in both Greece and Rome, found in honorific and commemorative contexts throughout antiquity. And yet the name of the state is written using the Roman letter shapes (specifically ‘V’ instead of ‘U’) and is decorated with egg and dart and dentil mouldings. The exedra is also ubiquitous, as honorific benches also occurred in both places. The bronze statue, called the ‘Spirit of the Republic’ is based on Nike of Samothrace, the Greek goddess of victory who was depicted landing on the prow of a ship at the moment of victory. The left hand of the statue contains another Roman symbol, the fasces. This bundle of rods containing an axe was a symbol of political authority, and was carried by lictors who accompanied magistrates through the streets of the city, serving as a sort of bodyguard. Like the statue of Nike, the ‘Spirit of the Republic’ stands on the prow of a ship, to which a battering ram is attached. This was a common feature of ancient naval warfare and cannot be attributed to any one civilisation, although I would note that the shape of it does seem to closely resemble rams recovered from the sea floor near Sicily, the site of a final battle in a Punic War. What I find fascinating about the design of the state memorials at Vicksburg is not necessarily that they are so heavily influenced by commemorative art and architecture of the Classical world: this is hardly unique in the U.S. (just look to the government buildings in Washington, D.C.), and more to the point, it makes sense to turn to civilisations known for their monumental structures, for honouring their war dead in a grandiose fashion, and perhaps more relevant to this location, suffering the horrors of civil war. The mixing of Greek and Roman styles, the odd combinations of orders, figures, and symbolic elements, however, is striking. To me, this indicates not so much the desire (or dare I say, adequate knowledge) for perfectly replicating Classical architecture, but rather the importance of using a traditional and universally recognised motif that was held in great esteem in order to sufficiently honour those whose dedication and sacrifice are still viewed as being part of the greatest tragedy to befall the U.S.
Today marks the first day not only of the new year, but also of a new month. 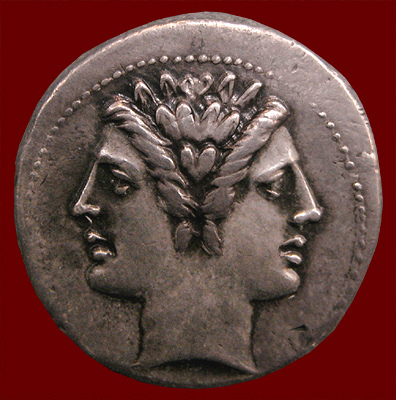 January, thought to be named for the Roman god Ianus (or more commonly in English, Janus), was the god of transitions, beginnings and endings, and thus was worshiped at the start or end of new years, new months, wars, harvests, marriages, and other times when a change occurred. He was depicted with two faces, one facing towards the past, and one the future. Although there is some confusion about how exactly he was worshiped and how this evolved over time, Ianus was an important deity in the Roman pantheon. Whilst he had his own temple in Rome (the doors of which were closed during times of peace and open during war), there is little evidence for his worship in Pompeii. However, the name itself, Ianuarius (and of course, the feminine version Ianuaria), is found in abundance in both lapidary and non-lapidary inscriptions. As per usual, many of the graffiti contain nothing more than a single name, so it is impossible to glean much information about either the status of the individual or the family he or she belongs to. But a number of the more formal texts, a few examples of which are contained herein, are more telling. Thermae / M(arci) Crassi Frugi / aqua marina et baln(ea) / aqua dulci Ianuarius l(ibertus). Baths of Marcus Crassus Frugus with seawater and baths with freshwater. Ianuarius, freedman. These private baths have never been positively identified archaeologically, but the information in the re-used inscription found elsewhere in the city does indicate the baths were managed by the owner’s freedman, and due to the use of seawater, has been posited to be close to the coastline. N(umerio) Istacidio Heleno / pag(ano) pag(i) Aug(usti) / N(umerio) Istacidio Ianuario / Mesoniae Satullae. In agro / pedes XV in fronte <p>edes XV. To Numerius Istacidius Helenus, member of the pagus Augustus, to Numerius Istacidius Ianuarius, to Mesonia Satulla. Depth fifteen feet, fifteen feet in front. This funerary epitaph, located on a relatively modest tomb outside of the Porta di Ercolano (21S), is believed to have belonged to a group of freedmen of the Istacidii family, who had their own, considerably more elaborate, tomb closer to the city gate (4AS). Although none of the individuals named here, including our eponymous Ianuarius, provide filiation, the membership in the pagus Augustus is one that is exclusively found for other former slaves in Pompeii. This tomb is typically identified as belonging to a man named Lucius Ceius Labeoni. If we follow Roman naming conventions for women, the name should be a feminised version of Ceius. What we have instead, in addition to the name Ianuaria, seems a conjunction of the names Lucius and Ceius. This in itself is rather odd, and combined with Ianuaria, may suggest she too is a freedwoman. L(ucius) Barbidius L(uci) l(iberti) / Communis mag(ister) / Pag(i) Aug(usti) Fel(icis) Suburb(ani), sibi et / Pithiae P(ubli) l(ibertae) Rufillae uxori, / Vitali et Ianuario l(iberis). Lucius Barbidius Communis, freedman of Lucius, magistrate of the pagus Augustus Felix Suburbanus, [made this] for himself and Pithia Rufilla, freedwoman of Publius, his wife, [as well as] Vitalius and Ianuarius, children. Ianuarius / v(ixit) a(nnis) II. There is some disagreement amongst scholars as to whether or not the ‘l’ in the last line of the initial text should be expand as I have it here as liberis or liberti, meaning freedman. However, as both these are in fact children (Vitalius died at the age of three), and have only a single name, it is perfectly clear that they were still in fact slaves at the time of their deaths. There is one further columella of a slave, found some distance from the city, in the Fondo Santilli area. Ianuarius / vix(it) an(nos) XXXV. Ianuarius lived thirty five years. Again, we have a single name, indicating the enslaved status of the deceased. There is one final example, from a columella found in the same burial area, which seemingly negates the idea that this is a name used by those of servile origins. Laturnia / Ianuaria Calcaria / vix(it) ann(os) XXXXV. Laturnia Ianuaria Calcaria lived forty five years. Whilst it is not unheard of for a woman to have three names, it is a bit unusual in the time from which these burials seem to date and in Pompeii as a whole. One clue may come in the description of the lettering on this columella, which is described as ‘careless’. As there is no evidence for Ianuarius as a gens, it would appear that this text either contains a mistake, or this woman, likely a freedwoman, was given two names when she was a slave. What I find interesting is that, save the one somewhat suspect example, those who have this name are either slaves or of servile origin, and whilst it certainly is not unusual to find a specific name that is associated with a particular group, I am curious as to what it was exactly about the god Ianus that was attractive as a slave name. It has been claimed that the name Ianuarius was simply given to children born in the first month of the year (in which case, with a birthday in the next few weeks, I am much relieved my parents didn’t adopt that convention), but it would seem odd that only slaves are born that month. What I am wondering, though it is unlikely to be provable, is if some slaves were born with their fate already decided. Was a name derived from the god of transitions and new beginnings assigned to those who their owner one day intended to free? This may assume far more forethought regarding manumission and slavery than the Romans should be credited with, but it is an idea I find quite attractive at the start of a new year, facing my own transitions, and setting off on a different path. It is sentimental, I admit, but somehow reassuring to think that as you moved through life, you knew, simply from having the name Ianuarius, that someday, you would be given the chance to start anew.